At Tata Power-DDL, our mission is to provide consumers with the most comprehensive and end-to-end solutions to get them on the path of significant savings for the next 25 years. 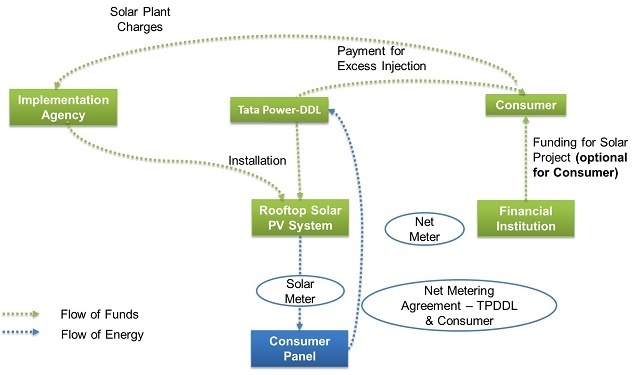 To facilitate the consumers for installation of rooftop solar projects, Tata Power-DDL has undertaken open competitive techno-commercial bidding procedure to empanel implementation agencies which will install solar projects on turnkey basis with optional comprehensive AMC for solar plants for a period of 5, 7or 10 years. All empanelled Agencies will be available for installation of Solar Projects of capacity ranging from 1 kWp to more than 500 kWp at Tata Power-DDL’s Consumer’s premises at prices determined through competitive bidding. Tata Power-DDL shall facilitate its consumers through project supervision & monitoring to ensure standardization of quality with strict adherence to the safety of the projects. The following model has been proposed in line with DERC’s Net Metering Guidelines proposed for renewable energy generation for self-consumption. Tata Power-DDL shall discharge its respective obligations towards applicant consumers strictly as per its scope of activities. The performance of the plant equipment installed at consumer site shall not be construed as liability/responsibility of Tata Power-DDL. Any untoward incident, mishap etc. at plant site resulting in loss of life/property shall be the sole risk responsibility of consumer implementing agency as the case may be, without any recourse to Tata Power-DDL. Tata Power-DDL shall not be held responsible/liable for any failure/non-compliance of the technical specifications of the proposed Solar PV plant. Consumer shall bear sole liability for maintaining the solar PV plant as per the prevailing laws/regulations notified from time to time as well as security of the plant. Still worrying about whether to go Solar or not? The example given above is purely for illustrative purpose and Tata Power-DDL in no way confirms the accuracy of the same. Savings (if any) shall be determined as per variety of factors, including but not limited to CUF of the plant, climactic conditions, consumer consumption, efficiency of the plant, rules, regulations and tariff as notified from time to time. Tata Power-DDL is not liable in case of difference in illustrated and actual savings.